When making your holiday shopping list, don’t forget that special someone who enjoys tinkering with cars in the garage all year-long or collects mechanic’s tools to complete a set. LaCava Brothers Auto Supply has a significant selection of auto repair tools and equipment that would make an excellent gift for that car person in your life. We have earned a reputation for having an expansive stock of Fall River auto parts and services, but we also have all of the tools, equipment, and accessories you need to get the job done right. Save time and money with performance tools that help to identify malfunctions in vehicles. Right now LaCava Brothers Auto Supply has a Diagnostic Scan Tool made by Performance Tool that works with most 1996 and later models including American, European, and Asian-made vehicles. For just $29.99 you can finally identify all of those Diagnostic Trouble Codes (DTCs) or shut off that pesky Malfunction Indicator Lamp (MIL) known as the “check engine light.” This diagnostic scan tool also erases DTC trouble codes and then resets the OBDII system. A complete user manual is included with the most current trouble codes. No repair or project can be completed without a set of safe jacks and jack stands. Stop by our location to speak with a representative about the best options for jacks and jack stands based on the make, model, and year of the vehicle your special someone works on the most. Whether it is for an ongoing renovation project or simple home services, it pays to have quality auto repair tools and equipment to make the work go a lot smoother. Choose from a variety of sizes, types, and name brands to provide the best gift this holiday season. 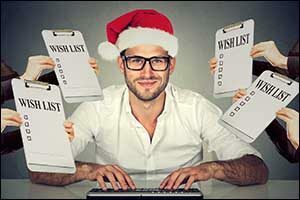 Even if you don’t need them – you want them! You don’t have to channel Tim “The Tool Man” Taylor to appreciate the value of power tools in any home or professional garage. Not sure what to get? Speak with one of our team members about the different types of power tools that are available through LaCava Brothers Auto Supply. We work with all of the top brands, and if we don’t have the item that you want in stock, we can get it for you as soon as possible. Certain jobs require specialized tools to access hard-to-reach parts or to securely put a new part in place. If you know someone who struggles with regular services on their primary vehicle or is working on a renovation project with some difficulty, check out our full selection of specialty tools. You just might find something at our auto supply in Fall River that can make the work a whole lot easier. We carry a large inventory of tools and supplies to best meet the needs of our customers. Nothing says “I love you” or “I care” than brand new safety equipment. Choose from top quality gloves and other safety items, spill cleanup products, hand cleaner, and cleaning products to help create a safe working environment. Ask about our safety equipment options to find that perfect gift for a friend or loved one. We carry professional grade products at our store because we also sell to the pros. Take advantage of this opportunity and buy that car person in your life the very best. Who doesn’t need more storage? Everyone can always use more options to safely store tools, power tools, and other equipment when not in use. Safety storage options are also available for cleaning products and automotive fluids to help keep a garage or workshop safe. Tool cases, chests, and other storage systems can help to make it more convenient to work on automotive repairs and services at home without wasting valuable time looking for a specific tool. If you are looking for great holiday gift ideas for that special someone, make sure to stop by our Fall River auto parts and services store on Bedford Street. We have a large selection of auto repair tools and equipment for you to browse, in addition to auto parts, accessories, fluids, and other essential gear. Give us a call at 508-676-1951 to find out our hours or to get directions. 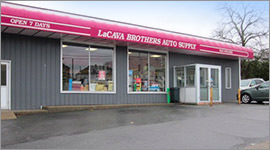 For over 70 years, LaCava Brothers Auto Supply has proudly served the Greater Fall River area with top quality auto supplies and services.